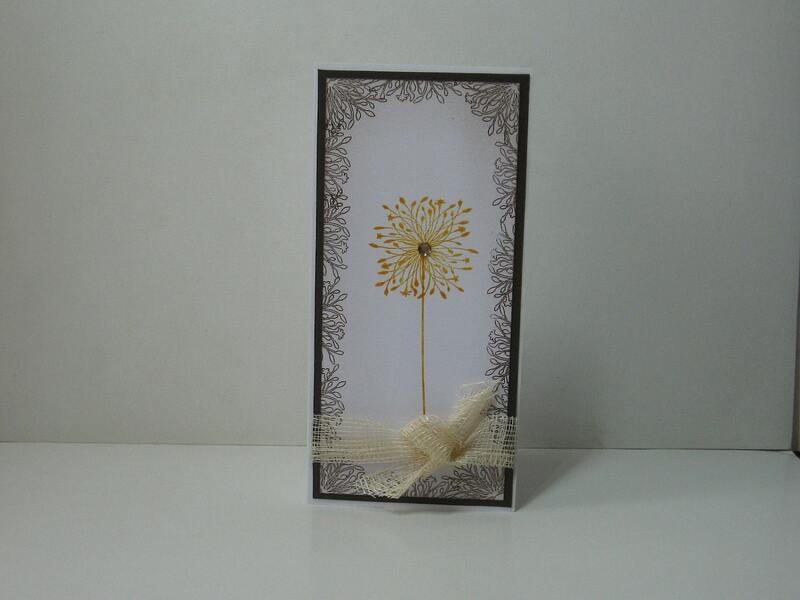 A simple and elegant card, with hand stamped images of Allium Flowers in Butterscotch Yellow and Expresso Brown. The card is a DL card, measures 4" x 8". The Allium has been handstamped in butterscotch yellow ink and a pale brown gem has been added to the centre. Alliums have been handstamped in expresso brown ink to frame it. The edge has also been dusted in a pale brown ink . The image is matted onto a plain brown card and mounted onto the white card base. An open weave straw ribbon has been added to finish. The inside oof the card contains a plain white insert, left blank for you to add your own personal message.